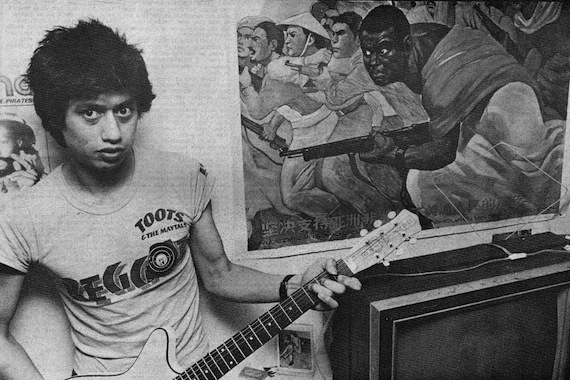 Alejandro Escovedo. In addition to having a serious wealth of music knowledge and songwriting chops, the one-time No Depression Artist of the Decade is also one of the most approachable, friendly and laid-back interviews we’ve had the pleasure of conducting. Having just released his newest record, Big Station, he spoke with Aquarium Drunkard via phone about the new album, working yet again with Chuck Prophet and Tony Visconti, the new record’s outward look and how knowing Ian Hunter personally doesn’t make you any less of a Mott the Hoople fanboy. Aquarium Drunkard: The last time you and I talked was when you had put out Real Animal, which was your first full record co-writing with Chuck Prophet and using Tony Visconti as your producer. Now, four years later, the new album is your third working with that pairing. So I was wondering what has inspired you to keep working with them and how that working relationship has developed over the years. Alejandro Escovedo: Well, obviously for me, when I realized Chuck and I had such a strong relationship and we were producing great songs and having a great time doing, it became nothing less than a pleasure to spend time with Chuck and write with him. And it’s developed to a point where we can work under any condition and come up with some really great stuff. Like you said, this is our third project and I love the songs we’ve come up with and they’re very different than what we’ve done in the past, so I’m very happy with the result. The same thing applies to Tony [Visconti]. Tony was fresh on Real Animal and that relationship turned out so well that it just seemed natural for us to do another record together. We did Street Songs of Love and I thought that was a great sounding record. I loved the way he produced it and the way he accepted the band and everything that we had done in order to prepare for that record. And with this one, Big Station, I really needed him to be the Tony Visconti producer that I’d known in the past with [David] Bowie – especially with Bowie, that type of production. So I think it was a very artistic production. He mixed it in a really beautiful way. We had tracks that had 70 overdubs or tracks on them, so there was a lot of mixing to do and I thought he did an amazing job. I love the way the record sounds and how he crafted it. I would love to make more records with Tony. AD: More and more over the years, people have to come to think about producers as being just as vital to the sound that an artist or band creates as the artist themselves. Has working with Tony and Chuck over these records been almost like developing a relationship with a band – in terms of learning to play together and building the art? AE: In a way it’s like a band. I say Tony is a part of our band – and of course Chuck is a part of our band because all the material we play is the result of the collaboration between Chuck and I. And then the records – making the records is such a kind of fragil relationship you have in the midst of making an album. Tony has become a very large part of that. If you could hear the demos that Chuck and I make and then the album that is the result of those demos, you’d be quite taken by the mileage that they seem to have gone between the first pass at a song to what they eventually become. So I would say yes, they’re both – it’s kind of like having, in the old days, you had Motown or Stax/Volt and guys would come in and write stuff and then go in and record it right away, but always the same people working on stuff. In a way it’s like that. AD: The last time we talked, when you talked about writing with Chuck, you said you were both storyteller songwriters and you would both have tape recorders and record your ideas, passing them back and forth and building on that. Has that process evolved or changed over the time of doing this more frequently? AE: No, I think we still use the same handheld kind of Walkman mics [laughs] tape recorders and those old Sonys and we love to just riff on ideas. The only thing that has changed now, instead of just playing them acoustically to each other, we’ve taken on the 808 [drum machine] as an instrument to help develop rhythms and tempos and things like that. There are most definitely more different rhythms on this record than in the past. I wanted it to be more expansive rhythmically, so the 808 helped us to develop that kind of stuff. AD: Is there a particular theme to this album? You have the title – Big Station – which is the title track also. In terms of the songs and structure, they seem to jump back and forth between autobiographical sounding songs and things that are more storytelling. Is there any theme that ties them together, or is this more just a collection of songs you felt worked together? AE: We felt that the theme was of someone looking outward rather than inward. To kind of take in all that one sees as the result of the media – the crazy, horrific things that are just naturally viewed on television now. One of the main differences was that we wanted the record to be less reflective and introspective but more outward looking. And I hope that’s something that people tend to pick up on with this record. AD: There are at least a couple of songs on the album that seem to pick up on the drug wars going on around the U.S. and Mexico border and others that deal with addiction. Was that something that came up a bunch in looking outward? AE: When Chuck and I write, we sometimes go down to Baja to write. We surf and hang out on the beach and stuff and write songs. When we’d been there the last time, we went down to the very tip – around Cabo – and there were a lot of militia types driving around in armored cars and big humvees. Obviously the cartels had made a presence there and these people were there to supposedly protect the tourists. So we saw that first hand, and then there was a lot of media stuff about the cartels that we witnessed together – stories that we heard while we were down there and just the nature of what Mexico is like at this point. And I think that really affected us and what we wanted to say in song. The addiction thing that you’re talking about – it’s kind of like – I was thinking about “San Antonio Rain” [from Big Station] today and thinking that if you were to break that song down, I could tell you what each verse and word were meant to be. And a lot of them are addictions – but they’re addictions to romance, addictions to music and playing music regardless of the costs spiritually or personally. They’re about those kind of things. It’s about a guy who’s looking at the world from the bottom, but not because it’s the end – it’s the place he’s found himself after a long life. He’s become a worker – a person who doesn’t have a lot, he’s not affluent, he’s not extremely poor – he’s just getting by. And that’s the way I view the perspective of the record. AD: You turned 60 last year – so is some of that perspective shaped by turning 60? Did that affect you at all in terms of getting older? AE: Most definitely. [laughs] You turn 60 and obviously your perspective becomes different. You know the line “Think I’ll go back to California, but I don’t think they’d let me in” [from “San Antonio Rain”] is kind of a guy thing. California is all about youth. California is all these memories of me as a young man. I don’t think they’d let me into that club anymore. I don’t belong there anymore. Maybe some of this disenchantment that you might find in the record is about trying to find that place when you get older – maybe feeling like society has no room for you. So I’d say yes, it was definitely affected by aging and getting older and watching music change, watching my kids grow up. You know my kids now have children of their own. AD: This is stepping back a bit, but on Street Songs of Love you had both Ian Hunter [of Mott the Hoople] and Bruce Springsteen playing on the record and you even payed a few shows with Bruce earlier this year. How did you get working with the two of them? AE: Well, the connection between Ian and I is a long lasting one that started with my love for Mott the Hoople. When I was young, I would follow Mott around southern California. I was a Mott the Hoople stalker in a way. I thought they were the greatest band ever. So as a result of that, when I was ill, Ian played on that Por Vida record and it was wonderful and very supportive. And that relationship blossomed into kind of a friendship. I just feel really grateful that I know him in that light and that I’m able to have him sing on my record is really special. Same with Bruce. I met him through my management, but he’s become a real supporter and kind enough to sing on my record and to do shows at South by Southwest together. I’m still in awe of both of them. I’m a fan, you know. AD: I was going to ask, that’s something that all of us as big music fans first, before you ever try to create your own music, as fans first we idolize certain musicians. Did getting to know Ian Hunter in that way, does that ever change the way you go back and listen to Mott the Hoople records, or are you still the same fan you always were? Great interview. One of my longtime favorites. Also, had the opportunity to briefly meet him, a down to earth cool fellow. Looking forward to seeing his old pal Walter Salas-Humaras play a house show just outside of Chicago next week. boy, i miss stephen bruton. Made my day! Had no idea there was a new album coming out. This song, San Antonio Rain, really has Chuck Prophet’s fingerprints on it, too. I strongly recommend that all AE fans check out Chuck’s latest album, Temple Beautiful. Really killer. If you like Texas rock you may also like these Texas lads. Pingback: Public Media Service » Blog Archive » IAN HUNTER – WHO REMEMBERS HIS SATURDAY GIGS?